With my wife and I in firm agreement that said chickens should not live in our backyard, we found a local 4H for our boy to join and since then we’ve gone Dutch on a chicken order from Murray McMurray Hatchery with another 4H family and volunteered to help out at a farm where my kid’s Japanese Bantams are living. In fact, the title of this post describes my unsuccessful attempt this morning to convince a one-thousand pound bovine to move back into his pasture (something my ten-year-old figured out when my attempts flopped). Last night, the 4H parents gathered to make plans for an ambitious set of summer and fall activities including petting zoos at several schools and retirement homes, parades, and – of course – the fall agricultural shows. One parent volunteered his home for Fun Day, another offered to help raise funds to buy a new pair of sheep shears, and the old timers walked us “newbies” through the process of entering our livestock into competitions (contests which can also include “statics,” ranging from biggest radishes to best colored eggs). As I sat in the meeting, my thoughts turned to the fact that we were all participating in a civic organization with a hundred years of history, making decisions and sharing experiences that would be familiar to people living in my parents and grandparents eras (although probably not to my actual parents and grandparents who would have suffered a heart attack if asked to touch a living – vs. barbecued – cow). Not far from where we met, I suspect a Boy Scout troop was also gathering like they’ve done for a century while some Knights of Columbus were sharing a drink and talking about the Kiwanis Club meeting they attended earlier that day. And did I mention our meeting was held in a church with its own decades of history and two millennia long legacy? These civic groups weave into larger tapestries. My 800-family synagogue is really made up of dozens of tinier civic units (Brotherhood, kids classes, choruses, study groups, Havurahs); my 20,000 person town is a pre-Web social network of hundreds of neighborhoods, clubs and institutions; the university I attended a complex of dormitories, classrooms, departments, clubs and teams. Far from being trivial, the thousands of decisions and conversations going on in meeting halls, living rooms, basements and backyards make us who we are. They define us as a community, a nation and a civilization. And yet civic society is also fragile. How many small towns fractured due to feuds which spanned generations? How many churches fell apart because internal conflict drove off members needed to keep the institution going? How many campuses were torn apart due to political conflict which broke along communal lines? 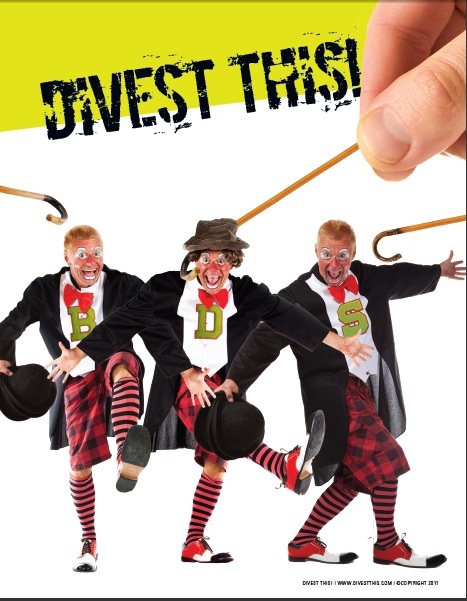 But what if dragging (or, even worse, tricking) an organization to embrace the divestment position creates the very poisons that can damage or even kill the institution into whose mouth the divest-from-Israel position has been stuffed? That’s irrelevant to BDS advocates who only see in our civic space a set of props to be manipulated in their own political psychodrama, consequences be damned. I’m going to go out on a limb and say that a group of parents deciding how they’ll afford a set of shears, a set of girl scouts learning to carve neckerchief slides, a church committee planning a summer picnic, all of them are infinitely more important than the causes touted by cynical political activists who hope to manipulate the church, the campus, the town, the union with their campaigns of moral blackmail and intimidation. If their causes are so just and important, let them stand on their own, or let them create their own civic space that creates something of value and does not simply attach itself, parasite-like, onto an organization whose reputation may outstrip its ability to avoid divestment’s lures.